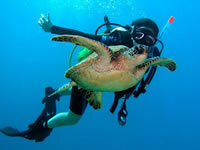 A holiday in North Cyprus is the perfect place for those who wish to enjoy some scuba diving. There are no tides to worry about and this is what makes North Cyprus the ideal scuba diving spot. The waters around the island are also warm for most of the year and diving can be done from April to December. This makes North Cyprus the place with the longest diving season in the world. What makes diving in North Cyprus so special is the fact that the ancient history of the island provides plenty of great things to see once you are under the ocean. Over the centuries many ships have been wrecked by the rugged coastline of North Cyprus and these are all waiting to be explored. The world’s oldest trading ship was found in these waters although it is now housed in the Shipwreck Museum in Kyrenia. There are a number of diving companies in North Cyprus with Kyrenia being the main centre. The majority of the diving schools in North Cyprus are based in Kyrenia. The main reason for this is the fact that there are over twenty different dive sites that are within reach of Kyrenia harbour. There are ancient wreck sites, underwater formations, and some excellent wildlife to be seen. The most popular of the North Cyprus dives is called the paradise and this is where you will be taken into caves, cuts, and canyons. Don’t forget to take your underwater camera with you as there are definitely some wonders to be seen. There are a number of dive safaris that take place in the Karpas region. These dive safaris are run by companies and include caverns, and ship wrecks. You can of course drive up to the Karpas if you have a hire car and just book in with one of the dive companies there. You will be amazed by the amount of marine life that is visible during a dive in North Cyprus. Due to the clear waters it is possible to have visibility up to 30 meters. If you are lucky you might just find yourself swimming with loggerhead turtles, stingrays, grouper, and wrasses. You may also come across octopus swimming around the corals. If you have never been scuba diving before then North Cyprus is a great place to learn. When looking for a dive school make sure that you look for one that is PADI approved. These schools mean that they provide the highest training standards and the highest level of training and equipment needed. The PADI Discover Scuba Diving Program will introduce you to the basics of scuba diving and you will receive full safety instructions. You will also get to experience a dive whilst accompanied by your instructor. If you enjoy the experience you can day further courses. There are four day dive courses that are available and most of the dive centres in North Cyprus offer PADI Bubblemaker courses which are specially designed for children. The dive centre that you choose will provide you with all the details you need but it is worth taking a bottle of water with you as you will be very thirsty after your dive. If diving is not your thing and you prefer snorkelling that won’t be a problem either as most of the dive centres also do snorkelling trips. 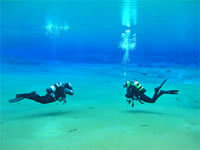 Winter diving is available in North Cyprus and in fact you can dive right up until Christmas. Some of the dive centres even provide dry suits so that you get a warmer and more comfortable dive. There are a number of rules that you must follow if you intend to dive in North Cyprus. You are not allowed to scuba dive alone and it is also illegal to touch or remove any of the historic artefacts that you might come across on your dive. If there are any emergencies there is a decompression chamber available at the Dr. Burhan Nalbantoğlu Hospital in Nicosia.